Smoked Lamb Chops recipe by Mariam at PakiRecipes.com. Blend onion and tomatoes together and marinade to lamb chops...also add all the spices except lemon juice and yoghurt. mix them well and set aside. Now heat a pan add oil and when the oil gets hot add the marniated lamb chops, mix them well and add a little bit of water to make the chops tender. Simmer it and let it cook on medium heat for 45 minutes. When their cooked reduce the remaining water on high heat. Then take the lamp chops out on a baking dish....spread them evenly then cover the lamb chops with the beaten yoghurt....garnish with green chillies mint leaves and onion rings and lemon juice...then heat the coal and give a smoke in the baking dish..and cover with alimunium foil and put it in the oven for about 5-7 min. 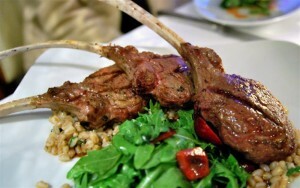 Delicious smoked lamb chops are ready to eat.